Employer liability springs from two sources: the legal theory of “respondeat superior” that holds a business responsible for employees’ actions during their work-related hours; and social host liability, which holds a provider of alcoholic beverages liable for injuries that visibly intoxicated people end up causing. Some employers have responded to these dangers of liability and others by deciding not to hold holiday parties, or by deciding not to serve drinks at them. Those who do decide to spread their holiday cheer–particularly if this involves “cheers” along with the clinking of glasses–need to take several precautions. First, they need to understand what can constitute harassment. Jury verdicts arising out of office party incidents can stem from behavior like overly graphic flirting, a hand on the shoulder that turns into something more, or comments about a blouse or skirt that take a suggestive tone. Typically, an isolated incident that’s not part of any larger pattern hasn’t been found actionable as constituting a “hostile environment” under Title VII of the Civil Rights Act, although if they build on earlier encounters, a harassment claim is more likely to stick. And more severe incidents at office parties can lead to an actionable claim even if isolated: Certainly anything that could be prosecuted as sexual assault, for example, could give rise to a claim, as could the unfortunate decision to hire lewd entertainment like a female stripper. To limit potential liability, employers need to take several preemptive measures. 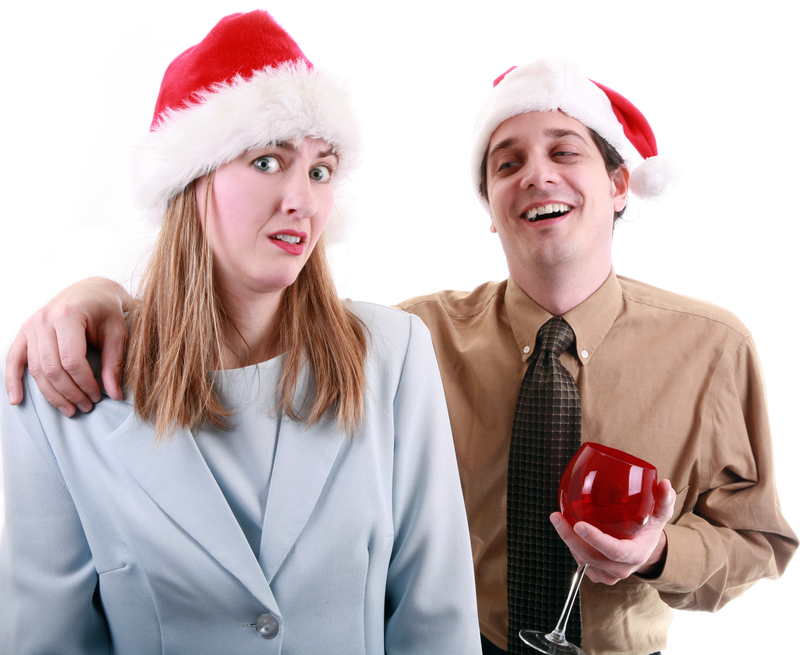 Employees should be reminded of their existing sexual harassment policies prior to holiday parties and any other work-related events; it’s best if they are prompted to somehow acknowledge they have reviewed the policy. Managers should be trained to ensure they will enforce the policy and be visible, positive and professional. In general, employers should set a tone of moderation through memos and meetings. If gift-giving is part of the office tradition, employers should warn against giving any gifts that could construed as somehow suggestive. To keep tabs on everyone’s tabs, employers should consider holding an event off-site with professional bartenders serving drinks–but try to avoid the possibility of a more free-flowing “after party” at a local bar or someone’s else. Probably the best ways to guard against inappropriate behavior are to invite spouses and children, and to hold parties in the afternoon, perhaps leading to greater sobriety. Limiting or doing away with the serving of alcohol diminishes the likelihood of sexual harassment. Since lack of alcohol entirely could lead to complaints about “boring” parties, another option is appointing designated “spotters” to watch those who have had one drink too many to ensure they don’t become “too friendly” with a co-worker. As with allegations of sexual harassment in any context, small businesses must thoroughly investigate any and all complaints–and if a complaint is found to be warranted, the employer must take swift, appropriate action against the perpetrator. Small businesses that take these precautions and ensure that employees do the same will be able to ring in the holidays without a sexual harassment claim following on the heels of their party like a bad hangover.